One hypothesis is that birds have altered their migration routes from historical ones, due to the various factors above. The way to discover this is to track them from their overwintering grounds to their breeding grounds. Perhaps numbers aren’t as depressed as scientist think. Perhaps the birds have indeed altered their routes. 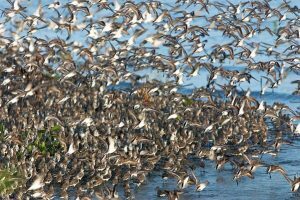 The joint consortium of Kahiltna Research Group, The Centre for Wildlife Ecology at Simon Fraser University, the Department of Defense and Partners in Flight summarized the extensive knowledge of western sandpiper northward migration, using all known studies through 2004. Why the northward migration only? –1) males and females and first time breeders migrate together only on the northward journey, and thus counts are for all migrants, 2) breeding populations pose difficult censusing counts because the nests are so scattered, so this method is not feasible, and 3) birds migrating south are not aggregated in time or space, but birds on the northward migration are concentrated in a small number of wetlands, and in large numbers, so accurate and more complete counts are more available during the northward migration. After summarizing the historical data, the next step was to determine where these birds go—i.e. what is their current route? Our approach was to track them via radios, and follow them in a small plane. During our second year, we placed radios on the birds in Panama and followed them up the coast towards Alaska. We radio-tagged birds in Panama Bay and tracked them up the west coast of Mexico and California in 2005 and 2006. These birds made a very long initial flight, stopping at Las Marismas in Sinaloa, (the National Estuaries, only parts of which are protected), a major overwintering and staging area for shorebird migration, and also at Tobari in Sonora. From there the birds went north along the large west coast Mexican estuaries to the border of California. In 2005, none of the Panama birds took the California coastal route. In 2005, Mexican birds, radio-tagged in Bahia Santa Maria Sinaloa, near Culiacan, skipped southern California and first appeared near Vandenberg Air Force Base and Morro Bay in Central coastal California. In 2006, we found birds from Panama at Buena Vista Lagoon, north of San Diego, and inland north of Paso Robles just south of Camp Roberts (California Army National Guard) along the Salinas River. These stopping places are unlike previously recorded stopover sites, in that they are small and could not support large numbers of birds at a time, unlike the large coastal estuaries in California and the inland prairie potholes. We believe that in 2005, the Panama birds may have flown an inland route east of the Sierra Nevada mountains through Nevada or Utah. This route is hypothesized to be a preferred route in wet years, which the winter of 2004-2005 was, filling up the prairie potholes with water. The year 205-2006 was fairly dry, and Panama birds took a coastal-to-west-of the Sierras route. The next step is for researchers to fly the east coast of Mexico, up the Yucatan to Texas, and then inland to Utah and Nevada, to determine if this inland route is being used frequently. Nils Warnock has found that birds from Bahia Santa Maria make it at least to San Francisco Bay. For many years, Mary Ann Bishop (USFS Cordova Alaska) has observed birds at the Copper River Delta for many years, which is similar to Panama Bay in that it is a funnel through which migrating shorebirds fly. With pooled results from all studies, we should be able at last to determine if birds have changed their routes.